If you’ve spent any time researching how to soundproof a car or van you will soon come across Dynamat. Dynamat is widely regarded as being the best brand for improving vehicle sound control, however, it is not cheap. If you want to treat your entire vehicle with it you can easily spend over $1000 on it. This article explores what some of the best available alternatives to Dynamat are. Noico is a well-respected brand in the sound deadening industry, it offers high-value sound insulation at very reasonable prices and is considered by many (including me) to be the best alternative to Dynamat. Noico offers some of the best value for money car sound deadening material available. Noico is 80 millimetres thick (13 mm more than Dynamat), however despite the extra thickness it is actually easy to cut to size than Dynamat. It is made of Butyl (the same material as Dynamat) which means it doesn’t degrade like Asphalt based mats do and it can handle high temperatures without any problems. While it’s not as thick or dense as some of its competitors its low price means you can afford to use double or even triple layers to achieve optimal performance. It doesn’t completely cancel noise – Noico recommends combining it with their closed cell foam for complete soundproofing. Easier to cut to size than Dynamat. Made from Butyl makes it excellent at heat resistance. Only costs $2 / square foot. If you don’t have a big budget for your car soundproofing project then Noico is a great option. Hushmat are one of Dynamat’s biggest competitors. Their mats are denser than Dynamat however they are slightly thinner – yet the overall sound deadening performance is more or less the same and it does a great job of reducing sound and vibration noises. One of the great things about Hushmat products is that they always come with a knife and roller. This means that, unlike with many similar products, you don’t have to spend extra on the tools required to cut your mats to size and stick them down securely. Hushmat compares very favourably with Dynamat on both heat and sound resistance. 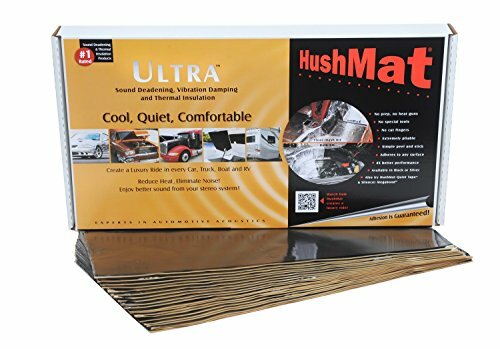 Hushmats density makes it a very reliable sound deadening product. Made from butyl-based rubber Hushmat boasts brilliant heat resistance and is safe to use in areas that may get very hot. However, if you are looking for a Dynamat alternative for price reasons Hushmat may disappoint as it’s pricing, though usually lower than Dynamat’s, is not much lower. 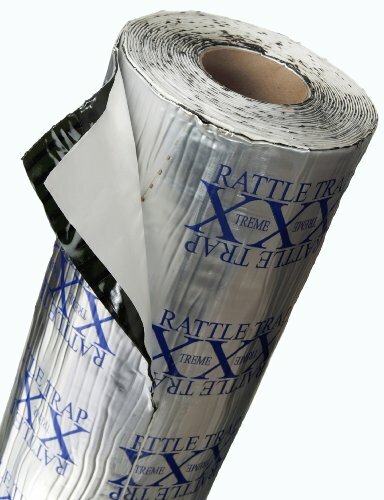 The FatMat is one of the best selling noise deadening products on the market. It’s cheap price point and effective sound deadening properties make it a winner with many users. FatMat have a few different products available including an 80-millimetre thick matt which is thicker than Dynamat. However just because a product is a best seller that doesn’t necessarily mean it is the best option, and this is very much the case with FatMat. FatMat is made from Asphalt, this gives it great sound deadening properties however if you live in a hot place (anywhere where temperatures above 86°F / 30°C are a common occurrence) then it is probably not a good choice. Regular high temperatures will cause FatMat to quickly degrade due to repeated melting. You make think this isn’t a problem if it is sealed inside the frame of your car door, however, over time constant heating up will quickly degrade the asphalt and make it ineffective for sound deadening. However, if you live in a cold place where temperatures above 86°F (30°C) are extremely rare then the FatMat is a great choice which will save you a lot of money compared to splashing out on Dynamat. Because FatMat is Asphalt based it is relatively easy to cut to size. To Install Fatmat you need to apply heat to it in order to allow the Asphalt to become sticky then press it firmly into place. Be aware that this can be a bit messy compared to peelable sticky back alternatives. You don’t have to look far to find someone on a forum or less reputable soundproofing website claiming that you can save a ton of money by simply using products like peel & seal, which are designed for window and door flashing, to deaden sound in your car. They are not fire retardant. They can’t deal with extreme changes in temperature. They aren’t made to resist oil. They will make your car smell extremely bad. All in all, they are a terrible and potentially dangerous thing to use for car sound deadening, if this is your only option then I strongly urge you to simply not bother with sound deadening at all…at least you won’t be turning your vehicle into a fire safety hazard. At much less than half the price of Dynamat (only $2 per square foot) price is a big reason why Noico is our favourite alternative to Dynamat but that’s not the only reason. Butyl based and 80 millimetres thick it performs almost as well as Dynamat. If you pair it with their closed cell foam (which is also very cheap) it performs just as well, if not better, than Dynamat. It’s also easier to cut than Dynamat which makes a big difference when you have a lot of square metres to cover! All in all, it’s a brilliant alternative which you can be confident will make a big difference to your car without breaking the bank. Sound deadening mats are used for reducing or totally eliminating noise vibrations in vehicles. Sound deadening mats are very effective tool for soundproofing cars and are a great way of dampening any vibrations which will make your car much quieter. Choosing the right sound deadening mat for your car needn’t be a difficult decision. You only need to know a few things about sound deadening mats to be able to make a well-informed purchase. Below are the four key things you need to be aware of. 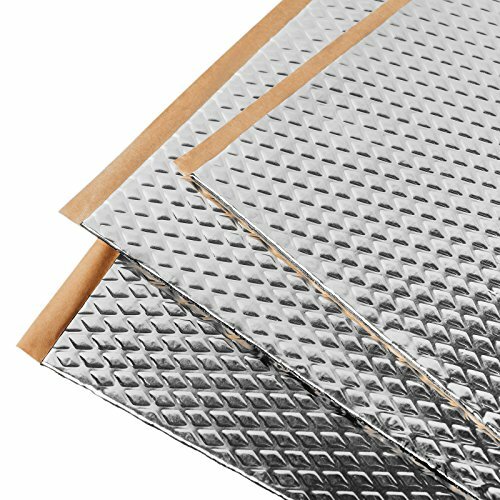 Most sound deadening mats and made from Butyl. Butyl is an alkyl radical which is derived from butane. Most car Mats are Butyl based, hence their thick rubbery appearance. Butyl has very high levels of heat resistance and it is very dense meaning that vibrations are easily absorbed and deadened making it the best choice of material for any sound deadening mat. A few brands (FatMat for example) choose instead to make their mats from Asphalt. This is significantly cheaper than Butyl however it has a very low level of heat resistance and can often degrade very quickly in hot countries due to constant heating and melting (if you’ve ever seen a tarmac road go sticky in hot weather you know what I’m talking about). If you live in a hot place asphalt based mats are not a good choice as they will quickly breakdown and become ineffective and sound deadening. As a general rule the thicker the mat the more sound is it capable of deadening so the more effective it will be. The standard size is usually 80 millimetres thick. If your mat is thinner than this you may require more layers to get satisfactory results. It is also important to consider the size that the mats come in, choosing a size which is a close fit for most parts of your car will save you money on wastage and will also save you a lot of time on unnecessary cutting. Most mats will need to be cut before they can be put into place. Cutting can be difficult particularly on some of the thicker mats so make sure you are well equipped with super sharp knives and appropriate safety gear. Most Butyl based mats usually use a peelable sticking surface which can be pressed into place for easy installation however some products require the addition of glue. Asphalt-based mats often require heating up with a blow torch to make them sticky before applying to your car – this can be messy! As previously mentioned the material that your mat is made from plays a big role in heat resistance. Butyl based mats are generally very good at withstanding heat with all the Butyl based products mentioned on this page being able to withstand over 250°F (121°C) so no matter how hot your car gets they will be just fine. Asphalt-based mats do not perform well in hot conditions, they will quickly begin to melt and will release a nasty rubbery smell which is hard to get out of your car. Dynamat is expensive, the price is the main reason that people look for alternatives. Thankfully there are good alternatives such as Noico available at significantly cheaper prices without compromising on performance. For an average sized car you can realistically expect to cover the whole thing in Noico for around $190, however you made need to use two layers to get optimum results which would cost $380. This is still a lot cheaper than Dynamat.